Have you ever wished you could change the background of OS X Lion’s Dashboard or Mission Control features? 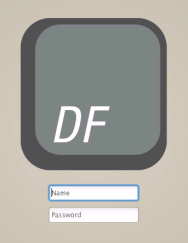 Or the look of the login screen or LaunchPad? If you browse the tips on Mac OS X Hints, you’ll find a bunch of individual hints—most requiring trips to Terminal or digging into system-level folders—for making these kinds of tweaks. But an easier approach is to use Lion Designer. Like previous Gem Lion Tweaks, Lion Designer consolidates a bunch of Lion-tweaking procedures in a single window, letting you make any of those changes with the click of a button. But whereas Lion Tweaks focuses on changing the way Lion behaves, Lion Designer lets you alter the way the OS looks. The aspects of Lion (OS X 10.7) you can change include the backgrounds for Mission Control, Dashboard, Launchpad, Launchpad folders, and the login screen. 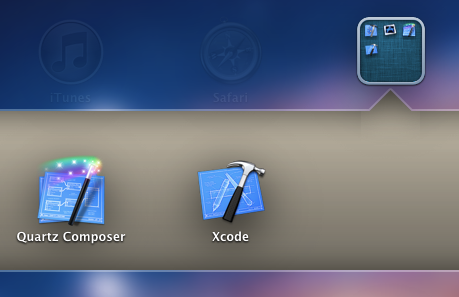 In addition, you can change the look of Launchpad folder icons and the login-screen icon. 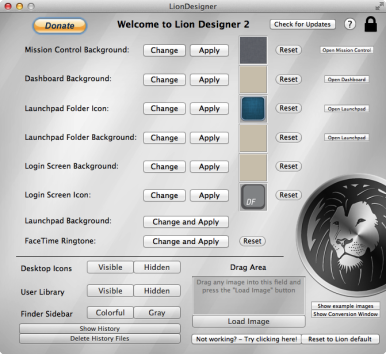 The developer provides a few example images within the Lion Designer application package—these folders should be displayed when you first click any Change button. In addition, clicking the Show History button shows a folder with any images you’ve previously used. If an image isn’t the right size or aspect ratio for full-screen use, clicking Show Conversion Window brings up Lion Designer’s image-conversion tool, which lets you ensure your image will display at full-screen size, rather than be tiled. Click Select An Image and choose your image, and then choose the conversion option: pad and fit the image (for most backgrounds), resize to fit larger backgrounds (mainly useful for the login-screen background), or custom size. This last option lets you specify a particular zoom value. This feature works fine, although if your original image is too small, or has a low resolution, it may look bad when scaled to full-screen size. Also, though the Conversion Window claims you can drag an image into the window’s well, I was rarely able to get this feature to work—I usually had to click Select An Image and use the navigation dialog box. The main Lion Designer window has a similar drag-and-drop box that also rarely worked for me. Lion Designer also lets you make a few other changes to Lion’s behavior. Like Lion Tweaks, it lets you change the visibility of the user-level Library folder with a click. But you can also choose to hide desktop icons, change the ringtone sound for Facetime calls, and even change the icons in Finder-window sidebars from Lion-style grayscale to Snow Leopard-style colorful. However, this last tweak requires that Lion Designer download and install a more-substantial system hack. In addition, the setting gets reverted on every restart, so you either need to use Lion Designer to change it every time you log in, or download a special AppleScript provided by the developer and configure that script as a login item. In addition to the minor issues I mentioned above, keep in mind that Lion Designer is replacing system-level files with your chosen images. While the modular nature of these features means the process shouldn’t be too risky, it’s not guaranteed to be safe—for example, if you choose a corrupted image file, there’s a chance it could cause problems. (I always recommend backing up before making such changes.) That said, if you ever regret a change, or experience problems, you can click the Reset button next to a particular setting to revert that item back to its stock appearance; alternatively, clicking Reset To Lion Default at the bottom of the Lion Designer window resets all settings and appearances back to their default values. The developer is also working on additional features for future versions, including allowing you to change the animation speed of Mission Control and Launchpad, and to adjust the size of Launchpad icons. If you’ve ever wanted to tweak OS X’s backgrounds and appearance, Lion Designer makes it relatively easy.